Set the Multi-Function Cooker to Sauté/Sear Mode, MEDIUM and press Start. Add shallot, butter and oil. Cook until tender, 5-6 minutes. Add rice and cook until slightly golden, stirring occasionally. Add garlic and cook for 1 minute. Add wine and tomatoes, cook stirring constantly, until the wine is absorbed. Stir in broth and salt. Cover and set the Multi-Function Cooker to Rice Mode. Select Rice 1 and press Start. Cook until Rice Cooker Mode cycle is complete (about 45 minutes). 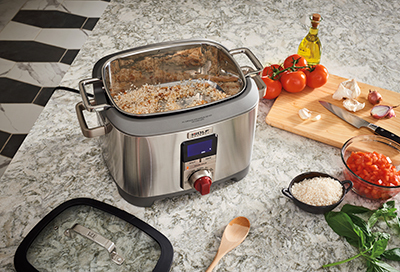 When finished cooking, uncover and remove the vessel from the Multi-Function Cooker. Stir in cheese, basil and black pepper. Top with additional cheese and garnish with additional basil, if desired.